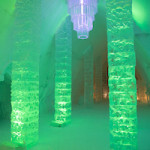 Throughout the day, the Hotel de Glace, located 10 minutes from downtown Quebec City, hosts throngs of tourists who come to tour the icy rooms and admire the beauty of this amazing place. Sculpted completely from snow and ice, this unique hotel is created each winter and demolished again each spring. This year’s theme of Myths and Legends from Around the World includes a 600-pound ice chandelier, an ice chapel where weddings are held, and an indoor ice slide. Many will enjoy cocktails in the “ice bar” where colorful drinks are served in glasses made from translucent blocks of ice.